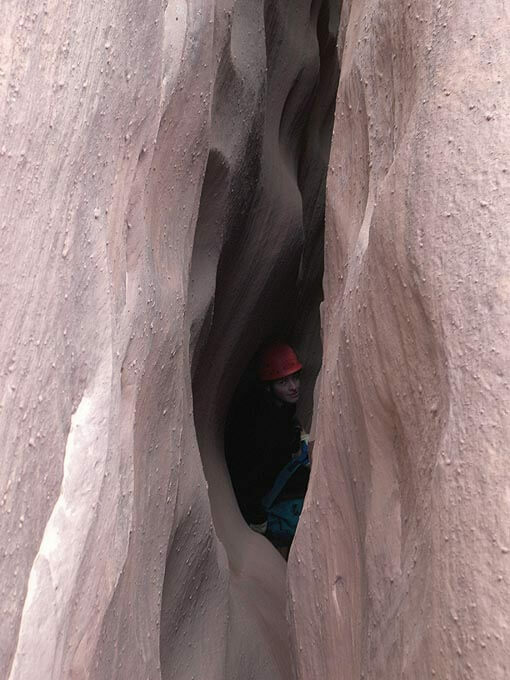 Chambers is a really nice, intense, half-day canyon in a remote corner of the Roost. Sometimes called South Fork of Bull Canyon, this section of technical canyon is only a quarter-mile long, takes an hour and a half or so, and has several distinct sections. The first section features narrow corridors between lovely chambers, thus the name Chambers. 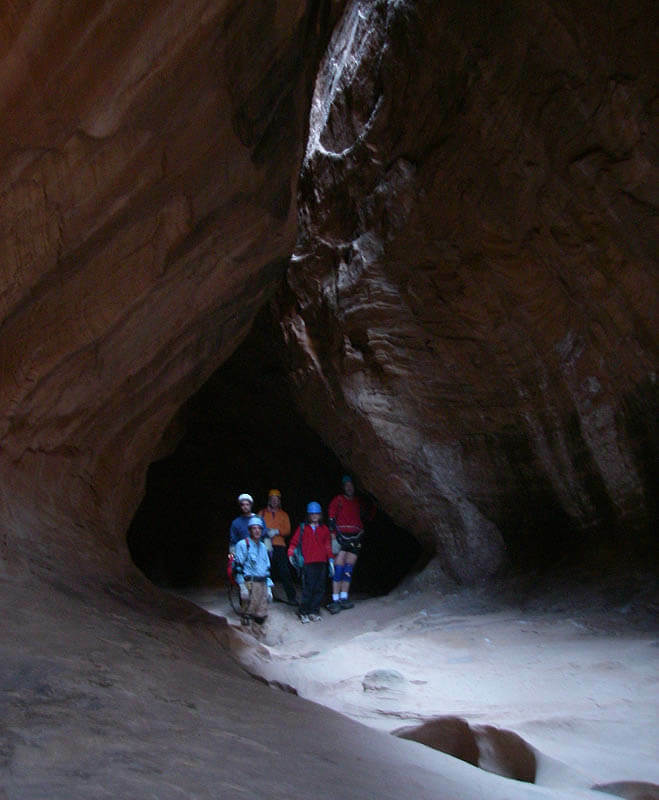 The canyon presents several technical obstacles. As mentioned, the first section has narrow corridors that are 9-10" wide. Those larger than 180 lbs will need to climb over a few spots, but holds and widenings are available. Further down, the canyon tosses a couple hard up-climbs at ya, and some strenuous side-ways chimneying in sections that are about 24" wide. 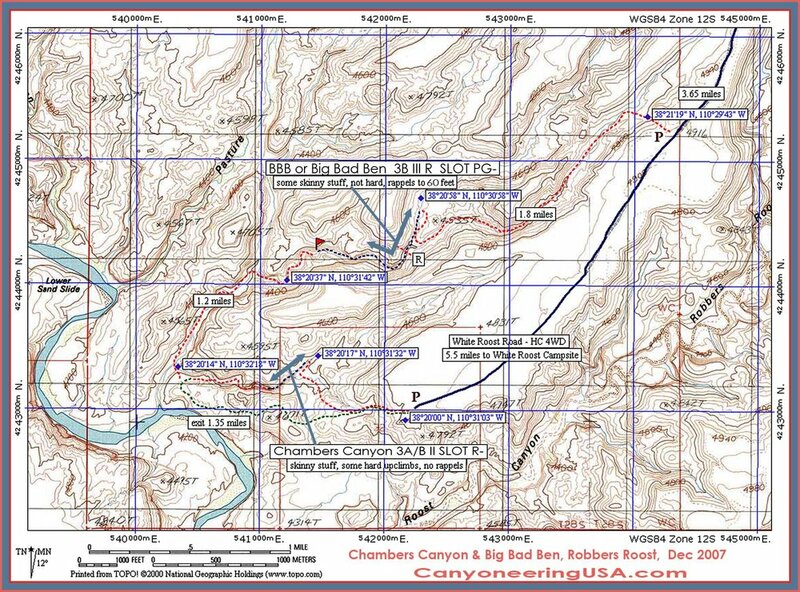 So, while the canyon is short, that quarter-mile will put a hurt on all but the fittest canyoneers. Loop route. High clearance vehicle required, 4WD for section of road below the White Roost Campsite. Narrow sections to 9" wide. Folks over 180 lbs will need to climb strenuously up and over. Sections of hard, narrow chimneying for all. A hard up-climb or two. A short, intense day in a very remote location. 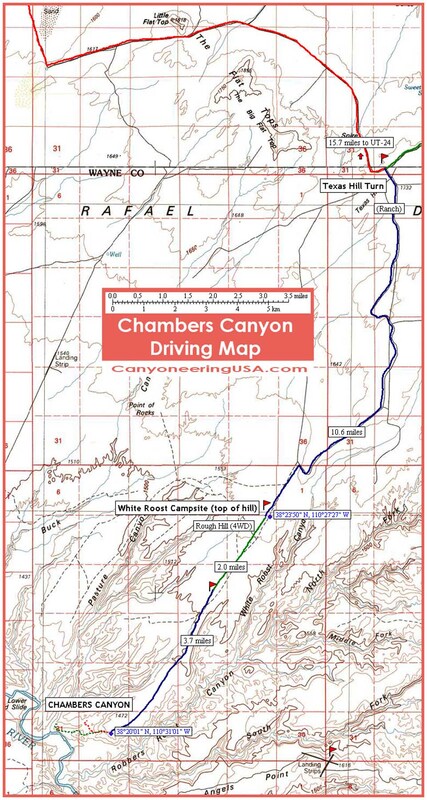 Chambers is part of an unnamed canyon system close to the Dirty Devil River, between Robbers Roost Canyon and Pasture Canyon. To reach the area, from UT-24, follow the Roost access road 15.7 miles to the top of Texas Hill. Turn Right (South) on the White Roost road, drive slowly through the ranch, then follow the road south (turning Left at the split) 10.6 miles to an open area at the top of a hill. This is the White Roost camping spot - not much of a camping spot, really, but the best in the area. For Chambers, continue south on this road, at first rutted and stony (requiring High Clearance 4WD) and then easier down on the flat. Follow the most-heavily used road past several splits (first left, then right) 5.7 miles to the end of the road on a dramatic bluff overlooking the Dirty Devil river and an expanse of slickrock. From the carpark, head due west, off the caprock scree and into the top of a drainage. Follow the drainage a half-mile to where it drops into a canyon. 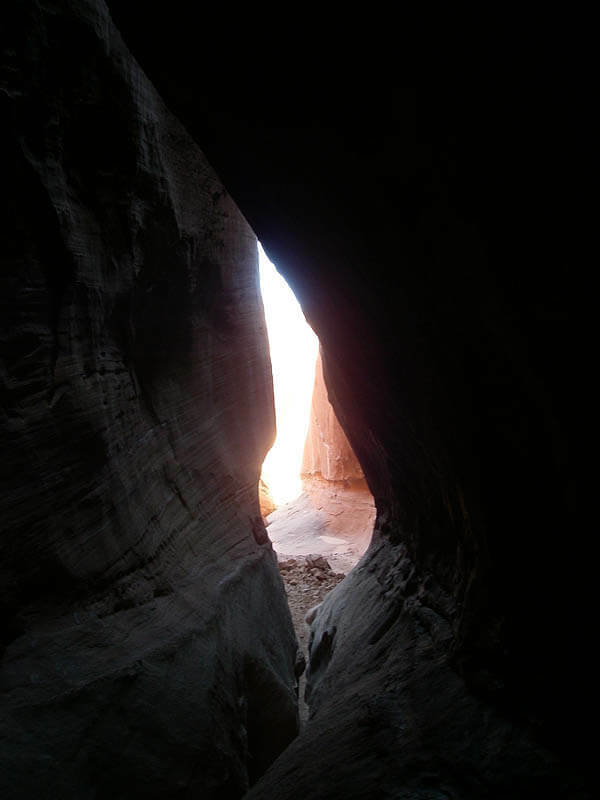 The canyon is Chambers, but we cannot get in here. Follow the rim up-canyon for 10 minutes until the wash can be entered easily. Pad-up for the tussle ahead. 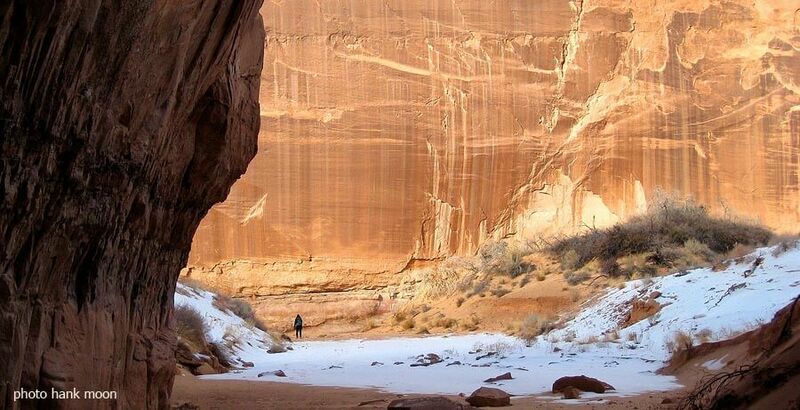 The canyon starts as a slit in the floor. Shimmy out until you fit, then slide down in. Shimmy forward. 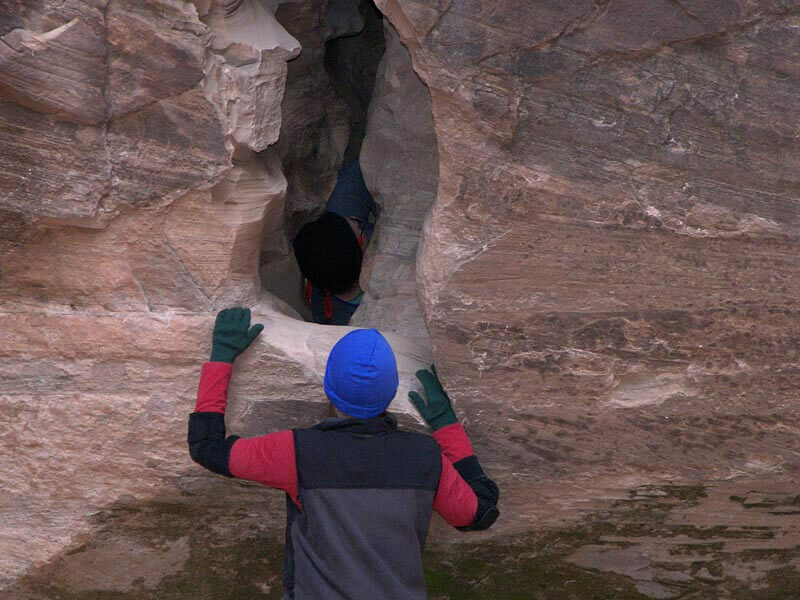 This first section features interesting tight squeezes between nice chambers. Eventually, the canyon relents and provides a lovely, Subway-like section before opening out more where the entry drainage comes in on the side. This is a good place to take a rest and catch some sunbeams if available. The third section involves some downclimbs including a nice elevator; which briskly evolves into some strenuous narrow chimneying with a few spicy upclimbs to keep you on your toes. 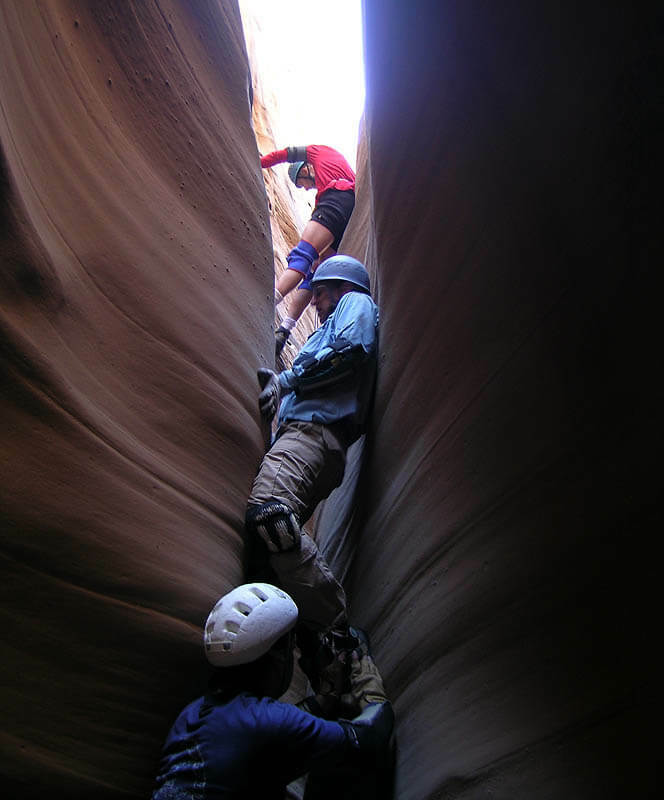 All too soon, the especially convoluted final section pops your team out into a wide canyon with soaring walls. Swagger downcanyon, enjoying the beautiful walls. 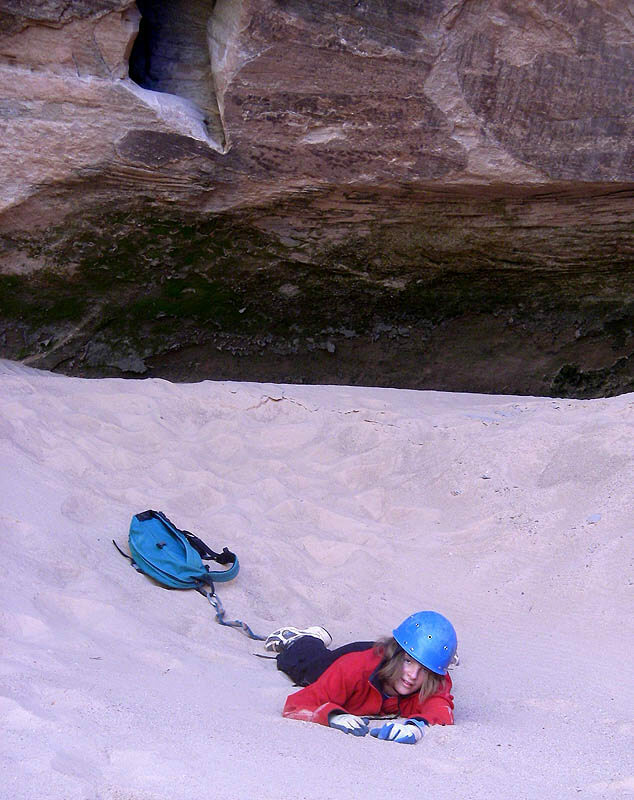 Just before the canyon enters a larger canyon, a sandpile offers an enticing way up on the Left (south). Continue closer to the confluence where a series of ledges allows easier (and less damaging) access to the bench. 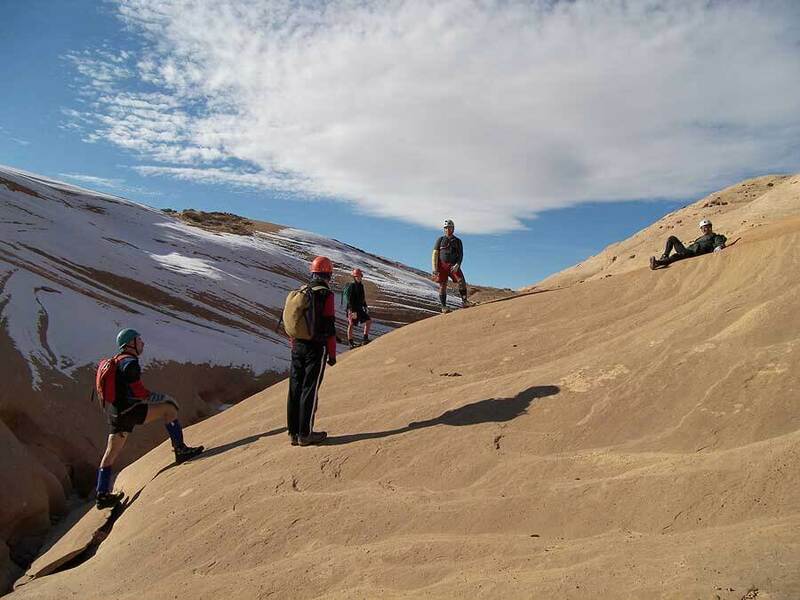 Find a reasonable climb up to the next level of bench, then head back upcanyon along the rim, generally following the ridge, then up to the drainage, to the rimrock and back to the carpark. 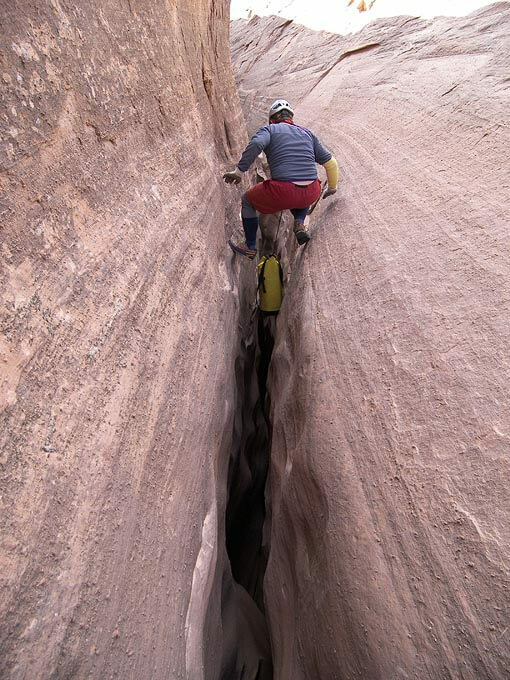 Our team first descended Chambers in November 2006, Aaron Ramras and Dave Pimental doing the whole thing, while the rest of us rapped in at the mid-way point, concerned about the narrowness of the upper section. This turned out to be a week after Ryan Cornia and Michael Kelsey descended the slot. Most of our team came back for the full meal on December 26, 2006. I got to it the first time on March 17, 2007; and have done it a few times since. Always a joy. Spring. Usually a time of unstable weather. Ram planned two weeks out in the Roost with family and friends, and I planned to join them. The usual late-night drive brought me in to Granary Spring at 2 am. Herr Ram, Martina Centava, Young (cute) Ram, Hankamo, Wyoming Dave (reclining). Malia taking the pics. Chambers Canyon Driving Map at right.